Make sure that important email doesn't go in the spam can! First, make sure you control the filtering. Some Internet Service Providers "helpfully" remove those messages that they deem to be spam before it even gets to your email client. You should view this practice with caution, because it means you aren't in direct control. Notice of Acceptance: Emails acknowledging receipt or acceptance of e-filing. These always come back to the filer only (not necessarily the attorney). 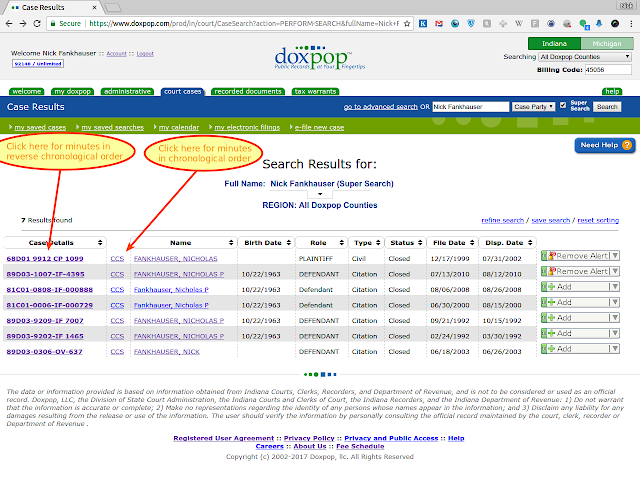 Notice of Service: These go to an attorney's public service contact, which may mean that administrative copies are being sent to an assistant as well as the attorney. Notices of Orders & Judgments: These aren't really part of e-filing, but are equally important. This is how most counties now deliver documents signed by the judge to you. These always go to a single email address. Doxpop Notifications: If you are a Doxpop subscriber, you may also have configured our service to send you notifications of changes in specific cases or more broadly, notification of any change to your hearing schedule. Go to [Gear Icon]->[Settings]->[Filters and Blocked Addresses]. Near the bottom of the page, just right of center, click on "Import Filters". 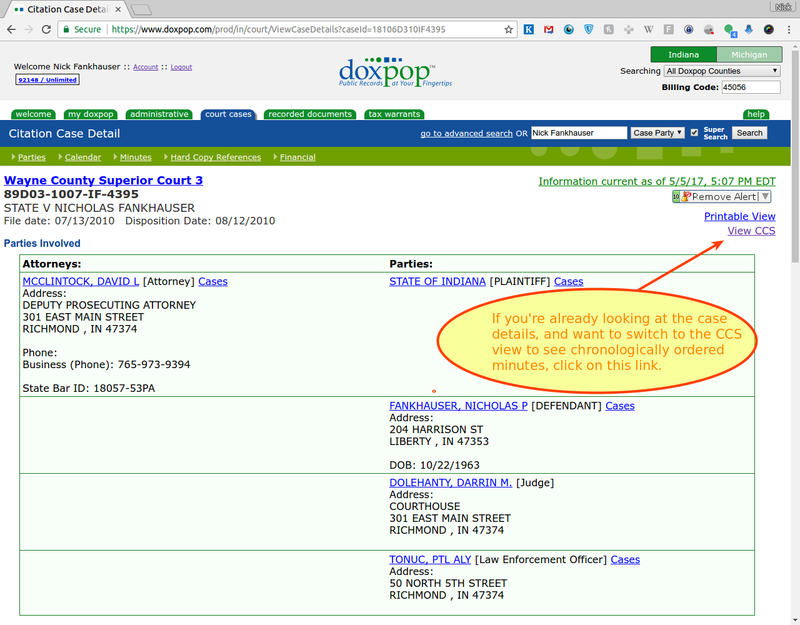 Browse to where you saved "doxpop_gmail_court_whitelist.xml" and select it. Scroll down to the bottom and click on "Create Filters"
E-Filing adoptions and how to pay the special fees. There has been some confusion about how the various fees are paid when an adoption case is filed. A $50 check for the putative father registry fee. The clerk's office in the county where you are filing will attach the checks to the portion of the paperwork that goes to the Health Department and submit the packet for processing. The confusion is due to the fact that prior to e-filing, some clerks collected these fees along with the filing fees and then disbursed the money to the State agencies themselves. For consistency, it was decided to have the filer supply these fees with separate checks in all counties where e-filing has been implemented. Filename length for e-filing extended to 100 characters. 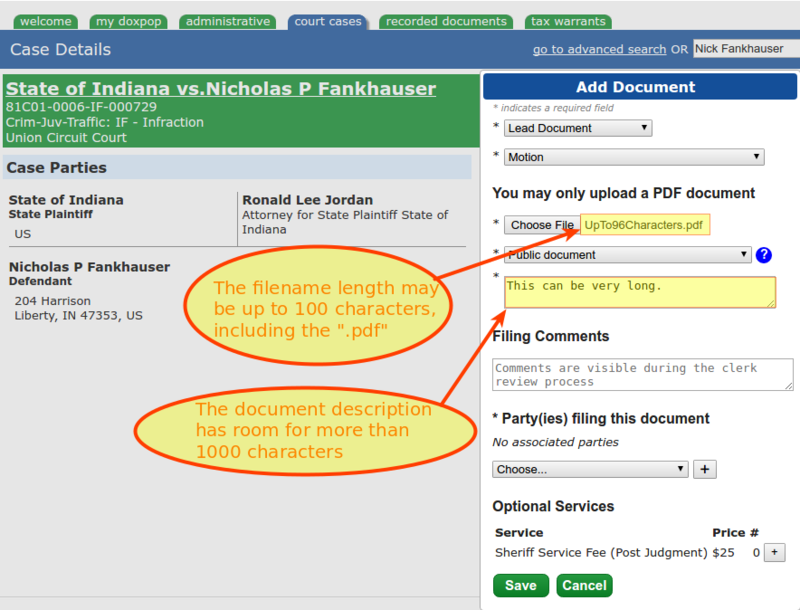 The folks operating the Indiana State E-filing Manager just increased the maximum length for filenames from 50 characters to 100 characters. That will make life easier for folks who use long filenames that include case numbers or party names to organize their PDF documents. The 100 character limit includes the ".pdf" portion, so effectively you have 96 characters to work with. 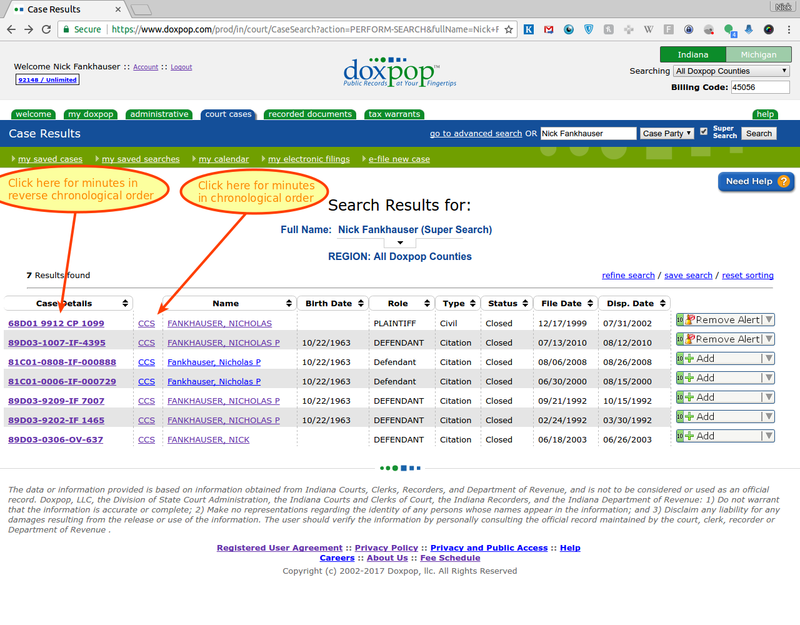 Note that the "file" and the "description" are two different fields. More than 1000 characters are allowed in the description. The picture below shows the difference. This change takes effect immediately.